I wish that nice people would stop being quite so scrupulous about “age-ism.” Their dire attempts to convince everyone that they hold no stereotypes about people like me have done much to embitter my life. I only learned about age-ism when it became politically incorrect. As a child (in the 1950s, thank you for asking), I assumed that you just grew up and stayed that way, with nothing significant about you changing except that one day you dropped dead. Wrinkles and rheumatism occurred, of course, but why niggle over the tiny differences between a thirty-year-old grown-up and a seventy-year-old grown-up? After all, dozens of famous writers didn’t “make it” until their 30s, 40s, 50s and, in some cases, even later than that. One of these dogged late-bloomers was actually 34 before his first novel was published! Probably had dentures. Three of the others were 39. One of them, granted, was 90, but he’d been publishing screenplays for over half a century. If you, Older Unpublished Writer, find this at all encouraging, you can read the article here. 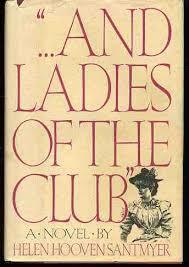 I tried to find encouragement in the memory of Helen Hooven Santmyer, whose novel And Ladies of the Club was published when she was 88 years old. Its 1176 pages weigh in at 3.1 pounds. The story goes that she had been working on it for 50 years. I hope I can work on my writing for 50 years; that would mean I’ll live to 114. I’d like to be published before then, though. Unhappily, I pursued my interest in Ms. Santmyer, and discovered that she had already published two novels before Ladies – the first when she was 30 and while she was holding down a full time job. 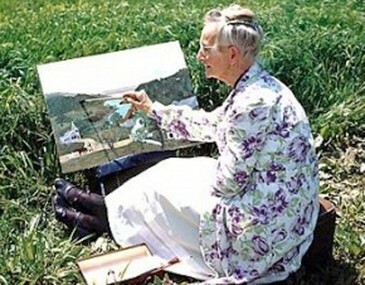 Too often older women’s artistic work is ignored or disregarded, and only those few who are already established receive the attention they deserve. Yet many women are at the height of their creative abilities in their later decades and have a great deal to contribute. Persimmon Tree is committed to bringing this wealth of fiction, nonfiction, poetry, and art to a broader audience, for the benefit of all. I’m not cheering, people. You mean somebody gets to say when I’m at the height of my creative powers? Even I don’t know. I’ll bet I won’t know when that is, or was, not even in the minute before I finally do drop dead. Do the twenty-somethings get to cry Ageism! when they read that? I say we drop the whole issue. Go sit down and write. Posted on January 18, 2017, in age, Heidi Wilson, writing and tagged age, ageism, And Ladies of the Club, Grandma Moses, Helen Hooven Santmyer, late bloomers, Persimmon Tree. Bookmark the permalink. 4 Comments. One of the reasons I chose a 60-something protagonist was that I was tired of reading in crime novels how a young detective knocked on the door and an old lady came to the door, barely functioning, dressed in a ragged housedress, etc. Why, “she must be at least 60!” the intrepid author would have his detective think. I wanted to show people in full flower later in life–which I think is your point. Who knows when people are at their best? Too true, Terry! I was once told that my protagonist HAD to be a woman in her thirties, forty at the oldest, to “find a market.” Tell it to Miss Marple! Way to go, Fran! And…this is the spooky part…I’m a Capricorn. When I was in my twenties, an astrologer friend of mine told me that Capricorn women seldom came into their power until they were in their mid-fifties. Of course, I thought I’d be dead by then. But my first book was published when I was 55, and here I am at 70 with 13 published books, and two more to be released soon. I so agree about the sweep of creative power — who knows when the peak was/is/will be? Who cares? I just know I love writing every single day.